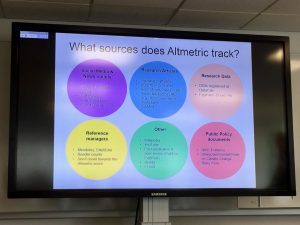 On Wednesday (12th July), a group of Stirling researchers and support staff gathered in the Enterprise Zone for the latest Research Bites session to learn more about using Altmetrics to strategically promote research. The University has long been making use of Altmetric and some research groups are making great use of it, with others keen to learn from them. Clare Allan, Senior Research Librarian, began the session with a very useful run through of the University’s subscription to Altmetric for Institutions, which is available for all staff to use. Clare explained that Altmetric tracks the attention of research papers and other research outputs, and produces an individual ‘donut’ for each output. A higher score indicates a larger amount of attention, and the different colours of the donut represent the different sources of attention. Data from most sources is updated on a daily basis and through data provided by the LARS team (a timely reminder to make sure all your outputs are logged in the University repository). Altmetric text mine media sources for mentions of the title and author names, and cross-reference this with an external database to determine which article the news story is about. For all other sources, for Altmetric to be able to pick up the mention, there needs to be a link to the article in the main body of the text – it helps if this is the research outputs’ STORRE handle. 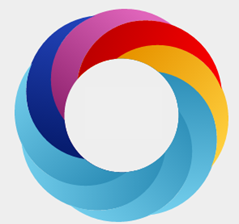 The University’s subscription to Altmetric allows for additional useful tools for staff such as setting up email alerts regarding article mentions for authors on a weekly or monthly basis. Kevin Tipton, Professor of Sport, Health and Exercise, explained that his Physiology, Exercise & Nutrition Research Group use Altmetric and Twitter to strategically push their research outputs and widen the reach of their publications. This approach has been working well for them – at present 35% of the top 40 Altmetrics articles for the University belong to his research group. As soon as a paper is published, Tweet about it; this is reciprocal in finding papers too. Be careful about getting caught up in the mundane affairs of Twitter; who are you arguing with? Kevin and his team have found that their strategy has had direct benefits on their altmetric story and he recalled that a recent paper on Monday 10th July had an altmetric score of 350. A tweet went out about the paper published in June 2017 and by time of presentation it had 365 – an increase achieved simply by tweeting the article throughout the team (at time of writing this post, the paper’s altmetric score had risen to 369). Getting press releases sent out from the University’s Communications, Marketing & Public Engagement Office when they have new articles published. Using Infographics to promote their outputs, as they provide a simple image illustrating the highlights of the research. Using more dynamic mediums of promotion such as Youtube videos and Conversation articles, where they often incorporate the findings of a number of research outputs into a single piece. 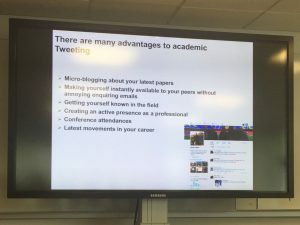 The session was really useful to see how metrics and platforms such as twitter can support researchers promotion of their research and I’m looking forward to talking some of the learning forward as I work on Research Performance Indicators & Metrics. If you missed the session, the slides can be found here. And if you’re interested in further communicating your research then sign up for the Research bites session on Kudos delivered by Lisa Haddow, Library and Archives Research Support Manager, on 16 Aug, at 12.30-1.30 in the Enterprise Zone, Library. Kudos: This session will help you grasp the basics of disseminating your research using Kudos. The University is working with Kudos throughout 2017, to help you maximize the reach and impact of your published work. Kudos is free, easy and quick to use. You need to invest just a few minutes explaining your work in plain language, enriching it with links to materials that add context, and sharing it via your social, web and email networks. This makes your work more accessible, and helps ensure it is found, read and applied by people all over the world, both within and beyond your field. Thanks for a nice write up Lisa 🙂 I thought it was a really enjoyable event: Kevin as inspiring as ever and great questions and discussion from our researchers. We were lucky that Emma Darling was there as well, the University’s new Head of Communications. Emma told us she is keen to hear from colleagues on forthcoming research papers and to support media work.